Composting: Restoring the fertility of soils! Composting is the most important technique we have to restore the fertility of the soil making efficiently use of available organic material. Through an aerobic process the organic waste is turned into a stable humus rich compost. Compost does not only recycle the nutrients needed for plant growth, it also feeds the soil with carbon. Though the use of compost a strong soil life will develop, building a natural resistance against pests and diseases and buildings the soil structure so that the water holding capacity of the soils increases and erosion can be minimised. This makes a compost based agricultural system more resilient in a changing climate with more weather extremes. 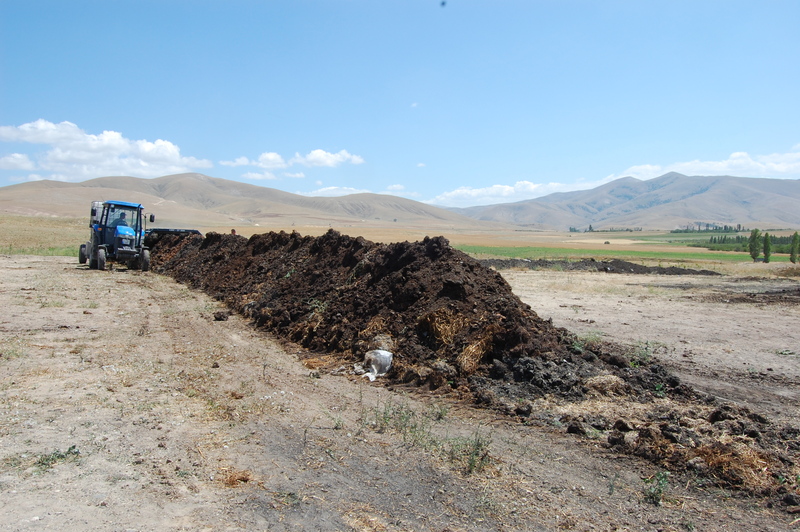 Controlled Microbial Composting in Turkey, 2012. I performed a feasibility study for a new composting project. Composting can also be a strong measure to mitigate climate change. Through the aerobic process the development of methane – which is as greenhousegas 24 times as strong as CO2 – is prevented. In some cases carbon credits can be generated and form an additional revenue stream for the composting project. During the last years, I have been lecturing on composting for a variety of groups: from students from Wageningen University and school children to German winegrowers and compost professionals (with Lubkes).